The smart money is liquidating assets, paying off debt and moving capital into collateral that isn't impaired by debt or speculative valuations. The Federal Reserve's sudden return to "accommodative" dovishness in response to the stock market's swoon telegraphs its intent to fire up QE once the recession kicks into gear. QE (quantitative easing) are monetary policies designed to ease borrowing and the issuance of credit, and to prop up assets such as stocks and real estate. This is pretty much the Fed's only lever, and it pulls this lever at any sign of weakness in stocks or the economy. That sets up an obvious question that few seem to ask: what happens when QE fails? What happens when the Fed launches QE and stocks fall as punters realize the rally is over? What happens when lowering interest rates doesn't spark more borrowing? What happens is the smart money sells everything that isn't nailed down, a process that is arguably already well underway. 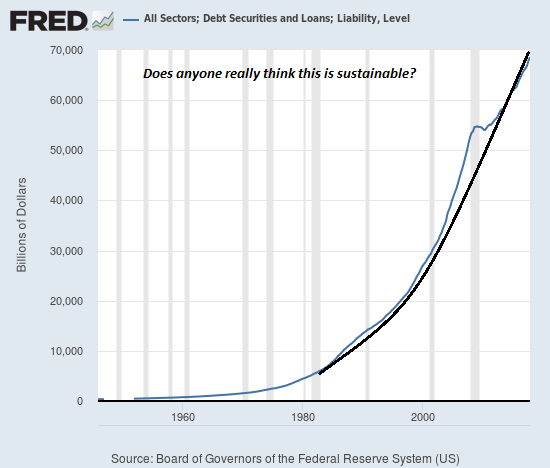 Why sell assets when QE has guaranteed gains in the past? Answer: exhaustion. There are limits to everything financial, and once those limits are reached, no amount of goosing will push the limits higher. Rather, further goosing only increases the fragility and vulnerability of the system. Price-earnings ratios only go so high before reversing, rents only go so high before reversing, and so on. Once the trend has visibly stagnated, smart money sells out because the gains are minimal while the risk of reversal is rising by the day. Why wait for losses to pile up? Sell now and avoid the self-reinforcing decline as everyone starts selling. The smart money is careful to mask the selling so as to avoid panicking the market. Smart money sells out slowly, in pieces small enough to avoid banging the bid lower. Alas, the Smart Money strategy is to count on greater fools to believe the shuck and jive of QE and the rest of the flim-flam: real estate never goes down, the economy will grow strongly through 2040, the next target for the S&P 500 is much higher, and so on. 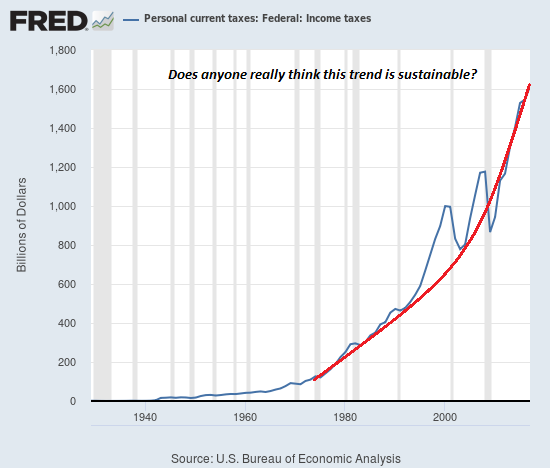 Take a look at these charts of total liabilities/debt and federal income tax collected and ask yourself: are these trends sustainable in an economy growing by a few percent a year? Federal income taxes collected have practically doubled from the recessionary nadir of 2009: does anyone really think they can double again in the next 9 years? These geometrically rising trendlines are the acme of unsustainability. The limits have been reached and reversal looms. Ask yourself why multiple bids for real estate have vanished and why the Fed is so anxious to publicly trumpet its dovishness. If the limits were far from being reached, why the tone of desperation? As I noted yesterday, every injection of stimulus weakens the response of the following dose. After a decade of never-ending stimulus, the positive effects of stimulus have been exhausted. Increasing the stimulus is toxic to an exhausted system pushing its intrinsic limits. As I observed yesterday, the smart money is liquidating assets, paying off debt and moving capital into collateral that isn't impaired by debt or speculative valuations. The Smart Money has secured the good seats at the banquet of consequences, the seats reserved for those with no debt, unimpaired collateral and little dependence on central bank stimulus or central state statistical legerdemain. Pathfinding our Destiny: Preventing the Final Fall of Our Democratic Republic ($6.95 ebook, $12 print): Read the first section for free in PDF format. My new mystery The Adventures of the Consulting Philosopher: The Disappearance of Drake is a ridiculously affordable $1.29 (Kindle) or $8.95 (print); read the first chapters for free (PDF). My book Money and Work Unchained is now $6.95 for the Kindle ebook and $15 for the print edition. Read the first section for free in PDF format.